From The Dagger: Apparently tired of the gratuitous shots rival fans have taken at former North Carolina two-sport star Julius Peppers after the accidental release of his transcript last week, ex-Tar Heels player and coach Matt Doherty has fired back. Doherty, who coached Peppers during the 2000-01 season, called the NFL defensive end "one of the smartest players I ever coached" on Twitter and noted that "doing poorly in school doesn't mean you are dumb." 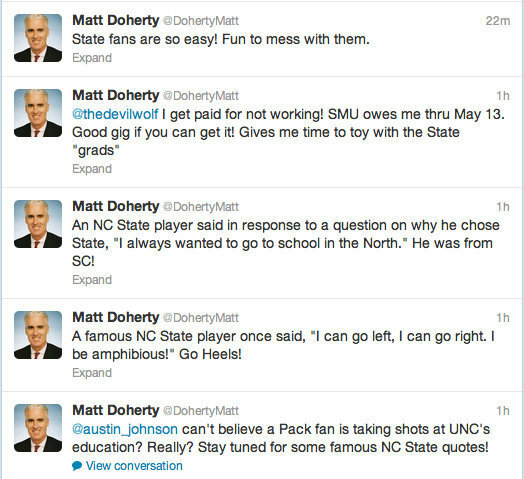 Then when an NC State supporter said that just meant Doherty had coached a lot of dumb players, the former North Carolina coach responded with some rivalry smack talk of his own. Some will probably say it's unbecoming of a former head coach to stoop to bantering with rival fans, but personally I found it hilarious. It's refreshing to see an ex-player and head coach care deeply about his school and have a sense of humor about defending it. At the same time, Doherty's comments about Peppers are a bit more disconcerting. It's great that he is taking the time to defend a former player whose academic woes have been wrongfully made public, but the message Doherty is sending is not one colleges will likely embrace. Doherty implies that it's fine Peppers dropped out because believe he did it "to get into a business called the NFL." Fair enough, no argument here. 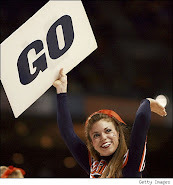 But that's not the right message for the vast majority of players who don't have Peppers' talent and need a college diploma to fall back on in case football or basketball does not work out.